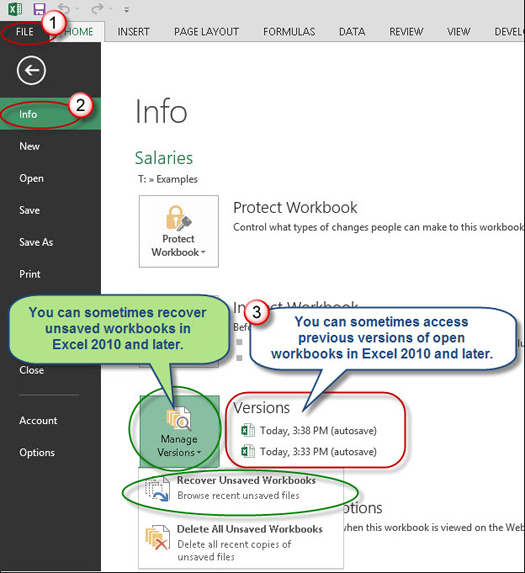 Recovering Unsaved Excel Workbooks » Accounting Advisors, Inc. It's every spreadsheet user's worst nightmare – you've worked on a workbook for a period of time, and then accidentally close it without saving. Or the power goes out, or Excel crashes . . . the list of spreadsheet hazards goes on and on. If you're using Excel 2010 or later, there's a pretty good chance you can mitigate much – but not all – of the risk related to unsaved workbooks. Regardless, in any version of Excel, you can raise the odds of having a recovered copy of your work available after a software crash. As shown in Figure 1, Excel has long had an AutoRecover feature that's designed to help you recover unsaved workbooks should Excel crash. If any version of Excel crashes, you sometimes get the opportunity to recover at least some of your work from the Document Recovery pane in Figure 1. However, this feature is limited to spreadsheets that were open in Excel at the time the program or your computer crashed. 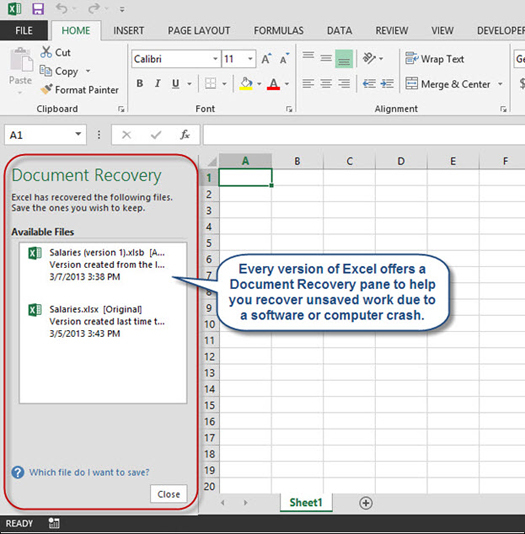 Figure 1: The Document Recovery pane appears automatically when warranted in all versions of Excel. Although somewhat helpful, the Document Recovery feature doesn't protect workbooks you inadvertently closed without saving by clicking “no” on that eponymous “Do you want to save the changes you made?” prompt. However, in Excel 2010 and later, you have the ability to not only recover unsaved files, but sometimes recover a version of a file from a few minutes earlier. This is helpful when you make a blunder that you can't undo, or when you want to see how a workbook looked a few minutes earlier. To do so, choose File, Info, and then look for the Manage Versions button, as shown in Figure 2. 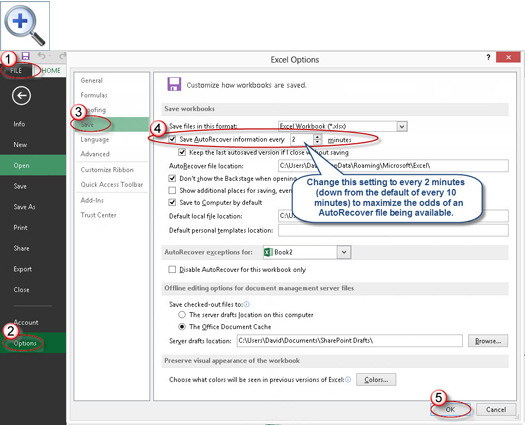 If previous versions are shown, you can open these alongside the most current version of your workbook and copy and paste data between the workbooks as needed. Figure 2: Excel 2010 and later offers the ability to access file versions that were inaccessible in Excel 2007 and earlier. Excel 2010 and later: As shown in Figure 3, choose File, Options, Save, and then change the Save AutoRecover Information setting to every two minutes, down from the default of every ten minutes. Excel 2007: Click the Office button, choose Excel Options, Save, and then change the Save AutoRecover Information setting to every two minutes, down from the default of every ten minutes. Excel 2003 and earlier: Choose Tools, Options, click the Save tab, and then change the Save AutoRecover Information setting to every two minutes, down from the default of every ten minutes. Bear in mind that Excel won't necessarily save your work every two minutes, as illustrated with the difference in times shown in Figure 2. Although I haven't studied it at length, my casual observation is that Excel saves temporary versions on a somewhat random basis, but regardless, lowering the setting to every two minutes increases the potential frequency for new versions to be saved. 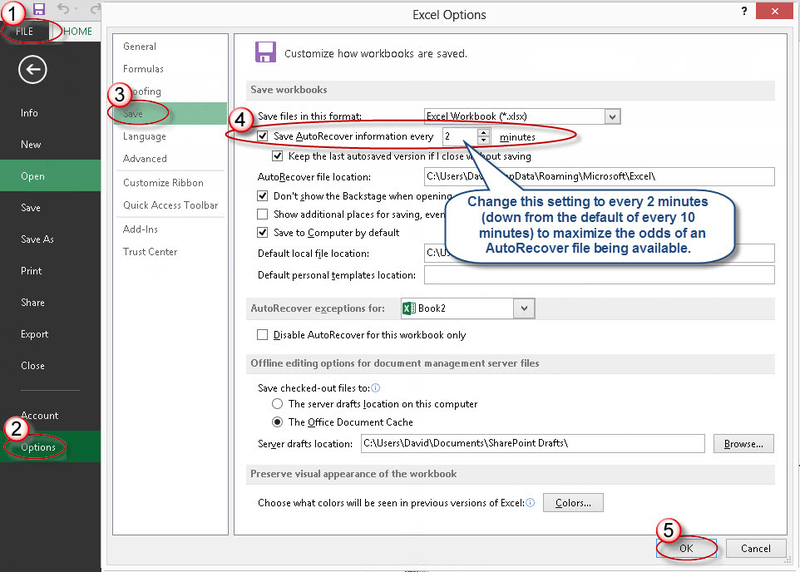 Figure 3: In any version of Excel you should change the AutoRecover frequency to every two minutes. In any version of Excel, documents presented in the Document Recovery pane are typically deleted when you close the pane and answer “yes” to the prompt that you no longer need access to those files. In Excel 2010 and later, my casual observation is that unsaved versions appear to linger for three or four days and then are swept away. In a Hail Mary situation, such as if the Document Recovery pane doesn't appear, or you're working in Excel 2007 and earlier and want to try to access a version from a few minutes earlier, it's worth a shot to use Windows Explorer to navigate to the folder listed in the AutoRecover File location. You might just get lucky and find an accessible version of your document. Although these features offer a modicum of safety against crashes, your best defense is to save frequently and to create multiple versions of your documents. Personally, I incorporate version numbers, such as 1.01, 1.02, and so on into some of my spreadsheet file names so I can go back in time when necessary.